This is a piece of writing I did for a Refugee Week writing project. Cloven hooves batter the door, splinters of wood pierce the darkness. A stink of greasy fleece and the pungency of urine underscore the tympanic discord of bone against metal. I herd my unconscious, hurry it until I wake and know I am once corralled in insomniac isolation. Outside, ewes heavy with lambs have come down off the mountain driven by cravings. Their solid skulls knock over dustbins, lids roll like cymbals and potato peelings are strewn edible runes. In the pre-dawn street of my childhood, wandering sheep prophesied a future of sleeplessness. Since then I have watched countless dawns grow munificent gold with the alchemy wasted, and the promising returns of day short changed by my miserly greed for sleep. Throughout nights deprived of that coinage, I have tuned in to the world Service and via an ear piece, assimilated shipping, weather and monetary forecasts along with the breaking news. This in turn has subliminally enriched my subconscious with vivid landscapes and exotic leading roles. In such times the currency of dreams inflated, and I hoarded it to barter with a reality bankrupted by fatigue. I have always loved this poem by Robert Frost. This Anthology “brings together Emily Dickinson and Elizabeth Bishop, Rimbaud and Sappho, Shakespeare and Shelley—the great poets of the Western literary heritage—on a theme with which each one has been acutely familiar. Lisa Russ Spaar has also unearthed ruminations on the sleepless nights of poets the world over: in a fascinatingly diverse anthology, she has harvested verse from Russian, Chinese, Japanese, Inuit, Vietnamese, Tamil, Yiddish, and Romanian poets, who together present an illuminating display of insomnia’s extraordinary and enduring legacy in widely different cultures through the centuries. 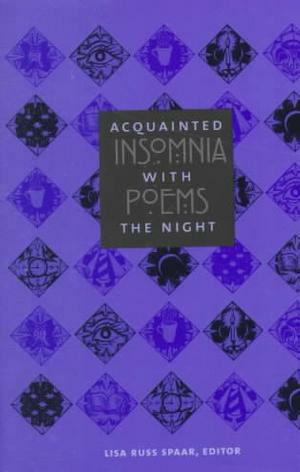 As these exquisite poems chart a course from solitude, through anxiety, to epiphany, the reader truly learns what it means to be acquainted with the night”.